Omelets and frittatas are eaten not only for breakfast, but also as a main dish. Breakfast for dinner is common at our house at least a few times each month. This is a tough one to write down it has a lot to do with what I have on hand or the craving I am having. 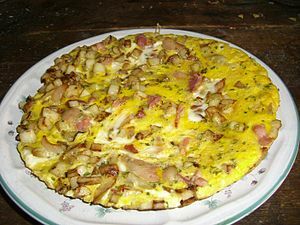 I have often wondered what the difference between an omelets and frittatas is, I saw nothing beside a fold and that most of my frittatas end up with a crisp golden brown potato bottom crust. Thanks to a quick Google search my thinking has been validated. Google: What is the difference between omelets and frittatas? Answer: In the strictest sense, the difference boils down to a matter of folding in a filling rather than mixing it in. Omelets traditionally have the egg mixture cooked and folded around a filling, while a frittata just mixes it all up, cooked in a mishmash combination all at once. Frittatas are often served at room temperature, making them perfect for brunches or larger groups. I will start with the basic frittata that I usually make – my wife calls it an omelet. 3-4 potatoes julienned or chop finely – you can blanch the julienned or par boiled the chopped if you want. 1 small red, green, yellow pepper or a mix of what you have on hand. Cheese – you have to eyeball, you will want enough to sprinkle over the omelet but not too heavy. Usually around ½ cup or so grated. Chop or mince the onions, peppers, mushroom and parsley. Julienned or chop finely the potatoes. Place 2 Tbsp. butter of oil in a medium-to-large ovenproof skillet, preferably non-stick, and turn the heat to medium. Add the onions, peppers sauté about 3-5 minutes add the mushroom for another 2-3 minutes. Remove from pan and set aside. Reheat the pan adding 2 Tbsp. of butter or oil (I like a mix it browns the potatoes better.) Add the potatoes in a single layer loosely covering the bottom of the pan and cook until they are browning on bottom this is not covering the bottom like a pie crust but is giving a good base. While it’s heating, beat together the eggs, salt, pepper and parsley/cilantro and then mix in the onions, peppers, mushroom. Gently pour the eggs into the skillet and turn the heat to medium-low. Top with the cheese of choice. Shake the pan gently over the burner for a minute or to. Cook, undisturbed, for about 8-10 minutes, or until the bottom of the frittata is firm. Transfer the skillet to the oven and bake, checking every 5 minutes or so, until the top of the frittata is no longer runny, 10 to 20 minutes more. Garnish and serve hot or at room temperature. Try without the potatoes cooking the same way, try with different type of potatoes, chopped up meat, bacon pretty much anything you like it is all good. See great for leftover night. This entry was posted in Baking, Breakfast, Eggs, Eggs for Dinner and tagged Frittata, Omelet, pepper, Potato. Bookmark the permalink.